Happy Thanksgiving to US readers of Thoroughblog! Champion older male in Canada could be up for grabs in the Clark (Grade 1) at Churchill tomorrow). ARE YOU KIDDING ME, the leader in the category and BREAKING LUCKY take on some of the best older horses on the continent in this very tough race. Another Canadian-bred SHAMAN GHOST, will be the likely favourite. The track played much slower than it was last week and that was perhaps due to the moisture that fell most of the evening (in the form of light snow). By today, that snow will have turned to rain and there will be quite a bit of rain in the next two days. Trainer RICHARD DAVIS won his first race of the Woodbine season with his 8th starter – ROXY’S BREW – who was placed first in race 4. Davis won 5 of 30 starts at Fort Erie and one of those winners was this 4yo gelding by Milwaukee Brew. This gelding was narrowly beaten by heavily favoured Hardcastle in this $10,000 claiming race but the winner was deemed guilty of bumping Executiveguts (who was 4th) twice in the stretch run as he bulled his way through. It was unfortunate as Hardcastle, who has only raced 11 times since 2012, was winning for the first time since November 2012. Roxy’s Brew is owned by Davis’ daughter Brianna and David Moran rode. Joey Gee Thoroughbreds won race 5 with the big, galloping fellow FINAL OFFER, who led all the way through 1 1.16 miles to win for the 3rd time this year. The son of Marchfield won this $10,00 claiming race by 5 lengths with a career best 76 Beyer Figure. Final Offer is the 25th winner for trainer Martin Drexler this year and his previous best at Woodbine was 26 wins. 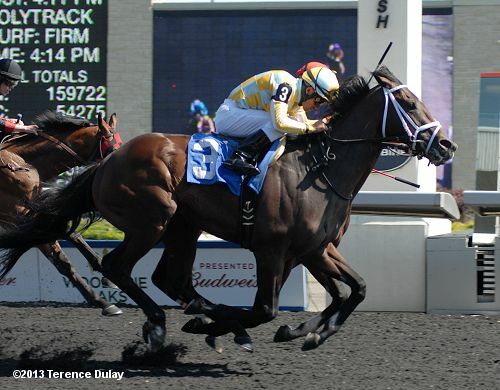 REGAL MARK led most of the way and won an allowance race worth $47,500, race 6 for Soli Mehta and partner. Trained by Kevin Attard (38 wins at the meeting), Regal Mark has 3 wins in 10 races this year and he is by Marcavelly. Classy 5yo BIG BAZINGA won for the 3rd time this season when he took a $20,000 claiming race for Bull and Bear Racing Stable and trainer Katerina Vassilieva. The Bluegrass Cat gelding, ridden by Alan Garcia, put up an 85 Beyer Figure in this win, his 5th in 17 career races. Vassilieva is just 1 win away from tying her career best of 12 wins in a season and she is just in her 7th year of training. The stallion was in the Keeneland November sale recently and was bought back for $45,000 (US) by Oxley before being moved to Ontario. DYNAMIC SKY joins a host of new stallions in Ontario this year including RELOAD (Northern Dawn Farm), AMI’S HOLIDAY (Colebrook) and HYPER (Tara Farms). The latter is a Grade 2 stakes winner on the grass by Victory Gallop who was recently bought at Keeneland November for $5,000 by Tony Russo. THREE BREEDS – ONE VISION. The Ontario horse racing industry has been getting together and discussing the state of the business going forward as there are only a couple of years left in the provincial government’s 5-year subsidy plan. Members of the Ontario Quarter Horse industry were out with great force at the Nov. 19 consultation meeting hosted by Ontario Racing to discuss future proposals for long-term funding for horse racing in the province. Ontario Racing (OR), the new industry association for horse racing in Ontario, has held several consultation meetings throughout Ontario to engage with industry members and obtain feedback from a funding framework. This plan will then be presented to the Ontario Lottery and Gaming Corporation and the Ontario government to provide input to the development of a roadmap to sustainable funding for the industry. -A new racetrack alliance: all Ontario racetracks that conduct live racing will be invited to create a new alliance. It is proposed that Woodbine Entertainment Group (WEG) will serve as the administrator of this new alliance. -Long-term, predictable funding: Ontario’s horse-racing industry can invest in their businesses beyond 2021. -Ongoing accountability and transparency: decision-making based on evidence and agreed upon success indicators. -Industry leadership: racetrack business plans, race dates, purse levels will be aligned across racetracks for a coordinated approach. Ontario Racing will play a key industry leadership role in the future. Quarter Horse racing is held at Ajax Downs which has been maintaining its racing and purses through its savings since the slots-at-racetracks revenue sharing program was cancelled four years ago. These funds are expected to run out after the 2018 season. The track can apply for an extension of its TPA (Transfer Payment Agreement), which was granted to all tracks by the Ontario Lottery and Gaming, or hope the proposed Racetrack Alliance begins by 2019 in order to have the funds required to make up for the savings depletion. “It’s difficult to try getting people to breed horses when there may be no funding after two years,” said Broadstock. “But we are asking our members to breed with faith; we are going to need horses. Ontario Racing, which represents all three breeds of racehorses in the province, will present the industry’s ideas and concerns to the government in January. Many issues with horsepeople include representation and how much control WEG will have as administrator of the Alliance.